Conductor Maggie Snively’s Overture Orchestra, Flagler Auditorium, 2016. The Flagler Youth Orchestra performs its first concert of the 2016-17 season on Wednesday, November 16th, at 7 p.m. at the Flagler Auditorium in Palm Coast. 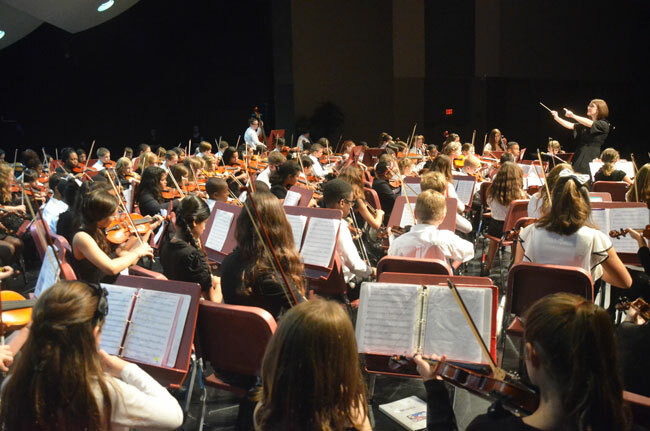 Conductor Sue Cryan and fellow associate conductors of the FYO will lead five orchestras with more than 375 string musicians — a cross-section of public, private and homeschooled students. The element-themed program will feature music by Stravinsky, Handel and much more.